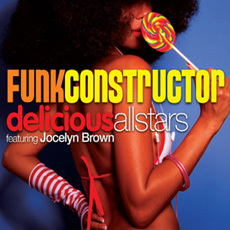 The Delicious Allstars have collaborated with Loopmasters and some of the industry’s best groove pioneers to give you the Funk AllStars collection, a definitive guide to the most authentic funk and soul loops on release. Soul Diva Jocelyn Brown has a rich tapestry of experience, from disco hit 'Keep on Bumpin' and 80's funk smash 'Somebody Else's Guy' to her continuing career alongside the finest players on the UK scene. Ed Moris has performed keys with the likes of Ray Gaskins, Watts Prophets and Tower of Power. Drums from FunkShone's Mike Bandoni, a stalwart of the London breaks/Acid Jazz scene; and Ollie Raphael, with Guitar and Bass deftly played by Sanj Sen, aka Indian Rope Man. On the horns, the multi-talented Matt Cronin, and lastly BS1 Records' Davide Carbone, a featured Loopmasters artist, co-produced this project with Ed and Sanj, using vintage mics and outboard effects. This collection includes nearly 1000 brand new funk samples designed to inspire next generation soul and funk classics! The samples on this CD have been specifically created with producers in mind to give you the edge when putting your funk foot forward. Funk Constructor features live drum and percussion grooves, drum hits, funky bass loops, rhythm and lead guitar lines, a huge collection of over 100 authentic rhodes, clavinet and hammond loops. Also includes over flute, brass section, sax and trumpet loops and vocal hits and loops from funk and soul legend Jocelyn Brown.